I started 30 days of cycling on October 4th, and have thus far kept to the goal. I’m on day 4 and I’ve got to say that my legs are giving me a bit of a beat down today. I’ll work past it, by taking a shorter less intense spin this afternoon. Since I started this week, I’ve logged 51 miles, which has put me over 700 for the year. I’m not a big mileage guy I guess, but maybe that will change. 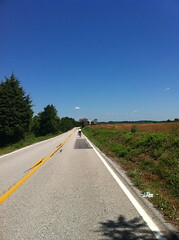 Tuesday’s ride was a 17 mile ride over some rolling hills and the gentle flatness of the B&A trail near my house. Wednesday was a simple end of the trail and back kind of day, and yesterday was a 21 mile ride over rolling hills and the B&A trail again. Today, I plan to get out after my last concall for work and hit the trial for a slower recovery ride spin. That will probably tack on an additional 12-13 miles and put me around 63 or 64 for miles for the work week. I am probably going to get up and join my local group ride tomorrow which will put another 26 on the odometer, but it is an early ride on a Saturday, so I may have to sleep in on that one. We’ll see. ← Can I do 30 days of cycling?